1 – KISS : Keep It Simple and Stupid. Blogs posts are meant to be light and for rapid digestion, so keep them clear of verbosity and complexity. Make them lively, interesting and attractive. 2- Add Value to your blog. Nothing creates long-term traffic more than value. 3- After every updation of your blog, try to send the updated links to aggregate and book marking sites. 4- A polemic blog is better than a non-polemic one. 5- You could also provide a way to translate your blog to multiple languages. 6- You could post a review about your site to some forums, bulletin boards or newsgroup. 7- Designing of the site always matter. Make it as useable as possible. 8- Engage in discussions with other blogs, comment on their blogs with links to the relevant posts at your blog. 9- Post heavily at your blog. Atleast five times a day. 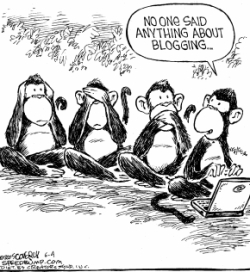 A bubbling blog is a sure-fire way to keep traffic coming in galore. Someone will find something to read, if choice is broad and visitors think that their likelihood of finding something readable is high at your site. 10- Also participate in blog carnivals or group writing projects. Got any tip? share it with us please.